Lacombe Pigs are a breed of Canadian pig. They are named after the Lacombe Research Centre in Lacombe, Alberta. They were the first strain of livestock developed in the Canada. Lacombe Pigs development began in 1947 with the crossing of Berkshire sows to Danish Landrace and Chester White boars. The goal was to produce a pig that would be appropriate for crossing with the Yorkshire, the dominant breed in Canada at the time. 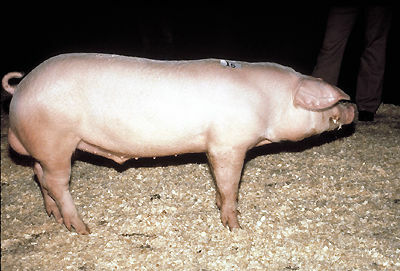 The Lacombe was eventually unveiled to pork producers in 1957, and quickly grew to be a popular breed in Canada. Lacombe Pigs are white, medium-sized, docile pigs. They have large drooping ears, are long bodied, short legs, and are very meaty. Unfortunately today Lacombe Pigs are considered critically endangered by Rare Breeds Canada.